We are all busy. It’s just a fact of life. I am not a fan of the busy trap and try not to respond with “busy” when someone asks how I’m doing, but I get it (more about how I feel about the busy cop out here). 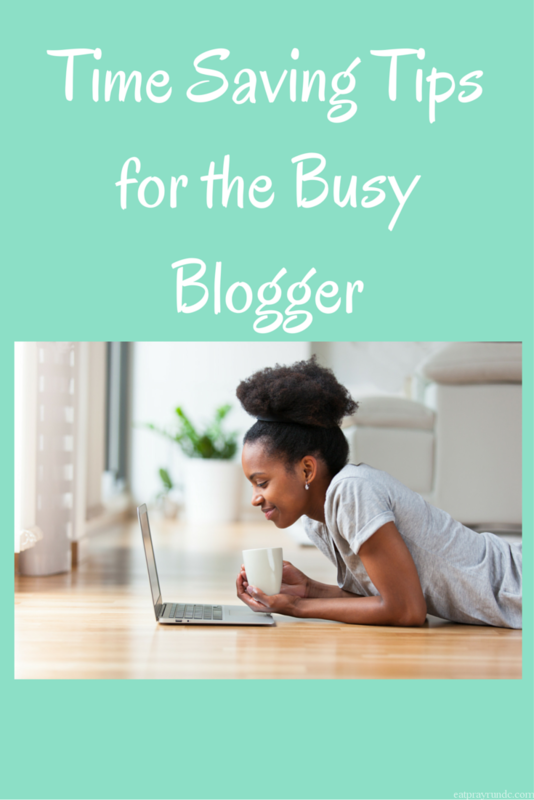 Sometimes I think about how blogging fits in with my schedule and I realized that I use a few time saving tips that others might find helpful. note: this post contains a couple affiliate links for products I love and use on a very regular basis. Blog on the go. I’ve mentioned this before but its key for me. I almost never post on the go (I find it easier to catch mistakes, etc. on a computer) but I very frequently draft on the go. I use the wordpress app for this, but you could also just make a note in your phone with your draft posts. Set aside blocks of time for social media tasks. Recently I’ve started setting aside 15 minute chunks of time to add pins to my Tailwind queue and to set up tweets promoting blog posts. I also use an app called latergramme (now called later) to set up Instagram posts in advance. Write down EVERY idea you have. It’s much easier to work with an existing idea than to come up with something new. Use an editorial calendar. I use CoSchedule and highly recommend it. It allows me to quickly see what I have coming, what I’ve posted lately and see where my social media promotion has been successful. I honestly don’t know what I’d do without CoSchedule at this point. I rely on it so much. When I mentioned setting aside blocks of time for social media, one of the things I was referencing was setting up social media promotion of posts via CoSchedule. They’ve made it easier lately, with the addition of something called social templates – basically with the click of a button, I can set a post to be promoted to the social media platform of my choice. SO easy. Seriously – check out CoSchedule. I would say that using this combination of tips has really helped me to be able to keep up my blogging (which I enjoy) while I’m in the midst of a challenging work season. How do you manage blogging when you have a lot of other things going on? Great tips! I haven’t heard of some of the websites you mentioned, I’ll have to go check them out! I have recently started writing down blog ideas. I just need to actually find the time to blog! writing down ideas is a great place to start, Amy!! That’s interesting. I’ve never heard of coscheduling but it sounds like it could be super helpful. Thanks for sharing these! I’m obsessed w/CoSchedule. It’s seriously awesome. Highly recommend it, Hollie! So I just downloaded Later and am now off to check out CoSchedule! THANK YOU!!!! I love these tips!! Your tips and challenges have helped me to start blogging regularly again!! I am patiently waiting for Buffer to add Instagram. They’ve said all along that IG does not allow 3rd Party apps but seems to me Later is just that! I’m failing miserably in the time management part on my blogging. I love the idea of setting aside just 15 min blocks to tasks. Thanks lady! I’ll definitely have to check some of these up, I’ve had a super busy couple of weeks and feel like my blog and Instagram are suffering a bit. I’m all about anything that can make my life easier! Yes – easier and more streamlined is always better!